This style of cooking potatoes is said to have originated in the Dauphiné region of Alpine southwestern France. Gratin Dauphinoise is warming and comforting, and very easy to make. Mix together the milk and cream in a small saucepan. Top and tail the garlic clove, cut it in half lengthways, and add it to the pan. Peel and coarsely chop the onion, and add that and the thyme, and bring the pan to a simmer. Let it gently bubble for about 5 minutes, then turn off the heat. Peel the potatoes and slice them into slices about 3mm (and eighth of an inch) thick. A mandoline is ideal for this. Preheat your oven to 140° C (284° F) for a fan/convection oven, or 160° C (320° F) conventional, or Gas 4. Strain the milk/cream mixture to remove the onion and garlic, stir in a pinch of nutmeg. Generously butter the inside of a roasting tin or gratin dish. Arrange a layer of potatoes in the bottom, sprinkle salt and pepper all over it, then pour in enough milk/cream mixture to just cover it. Add more layers, seasoning and liquid. For the top layer, use your best-looking slices of potato - you might even cut them into perfect discs with a pastry cutter - and overlap them slightly to create a kind of scalloped arrangement. Pour over the remaining liquid and grate the cheese all over the top. Bake for 1 hour. If the top layer doesn't look golden brown and crispy after this time, finish them with under a grill/broiler until it does. Let it stand for 5 minutes when it comes out of the oven because it will be very hot. Serve this as a side dish or a main. The video above is from the Keef Cooks YouTube channel. 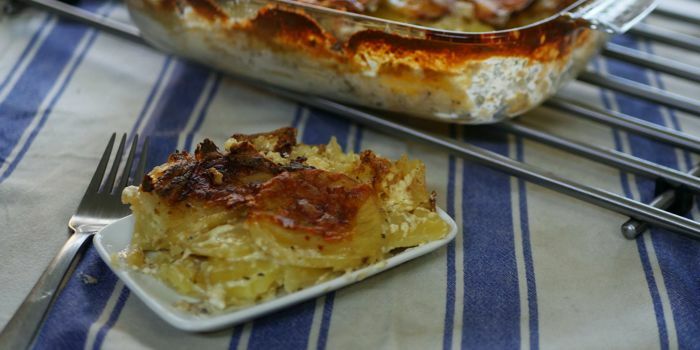 Click here to see the video recipe of Gratin Dauphinoise on YouTube. Prep time: 15 minutes. cooling time: 5 minutes. Total time: 1 hour 20 minutes.